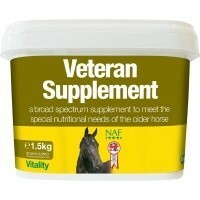 NAF Veteran Supplement for Older Horses is a complete supplement, expertly formulated to meet the nutritional requirements of veteran horses. This beneficial supplement is gentle on your horses gut and contains all the nutrients required by older horses, whether they are retired or still in work. NAF Veteran Supplement contains L Lysine amino acid, Di-calcium phosphate, probiotics and sulphur; all of which aim to support strong bones, good circulation, healthy joints and overall mobility and vitality.